Anyways, this is Stella. You may remember her from this post. She is now 3 months old, and I’m finally ready to present this Before & After. Not that it was that much of a challenge, but I’ve been pretty busy these past few weeks. I always start my photos in ACR – I made a couple of exposure, contrast and brightness adjustments before bringing it over to PSE7. As usual, I also ran Amy McMaster’s Squeaky Clean action (secret: I always adjust my levels – sliding my mid-range up to 1.26 or higher, I also always adjust the saturation by decreasing my reds and yellows). 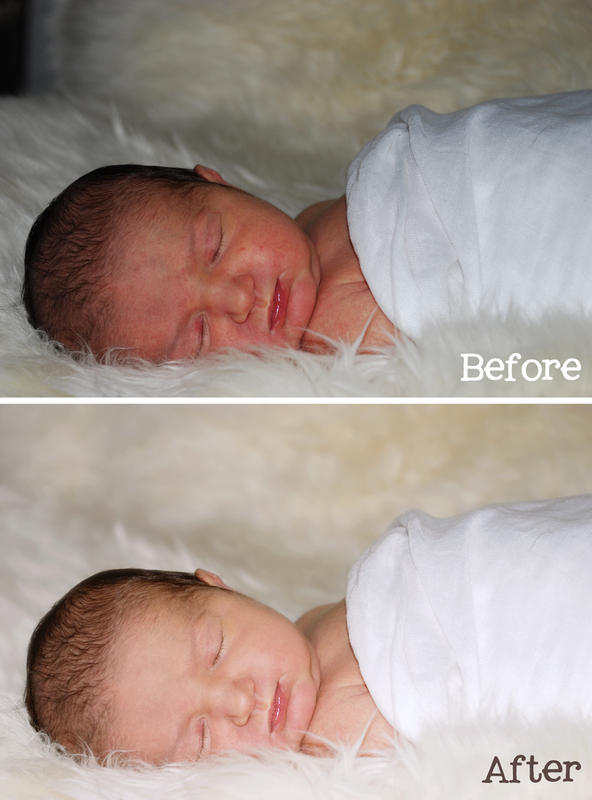 From there, I ran Coffeeshop Photography’s Baby Powder Room to even out Stella’s skin tone. I haven’t used this action in a while, but I really didn’t feel like replicating these steps manually. For those of you new to actions, you can’t simply click and go – you need to click on each layer and adjust, color in or color out (if you need more explanation, just let me know). Within this action, there is a step for eye define. Although her eyes are closed, I did use this layer slightly over her eyelashes to make them stand out just a touch. At this point, I worked on the background. This was a little tedious. I think I used the quick selection tool to select that dark spot in the upper left corner. I created a new layer by clicking ctrl J. I then made a copy of the background layer (ctrl J) and moved this layer to the top layer. I used a combination of the healing tool and cloning tool to even out the space. I then merged those layers and used the quick selection tool to reselect the entire background. I made the background it’s own layer, then went to filter, blur, gaussian blur to blur the background.